You may remember that, a few weeks ago, we wrote an article about the world’s first ‘Elephant Hospital’, a huge treatment facility and sanctuary that has opened in the northern state of Uttar Pradesh, India. 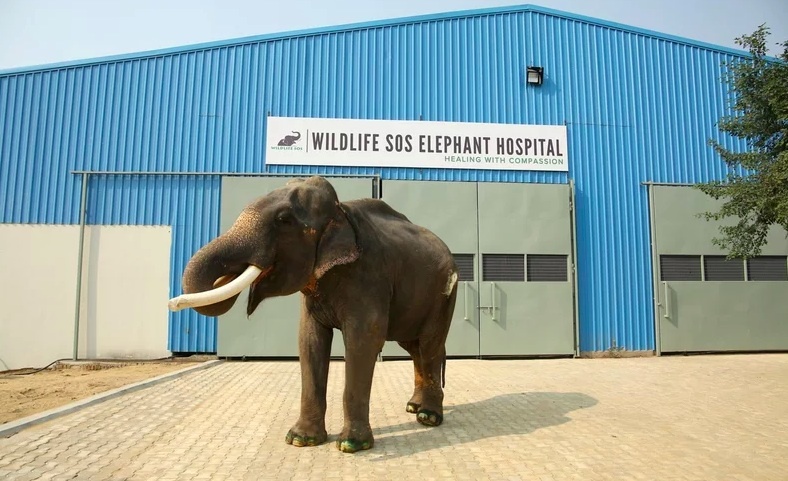 The center, which is operated by non-profit organisation Wildlife SOS, is a 12,000 square feet facility is designed to treat injured and sick elephants, whether they’ve had mishaps in the wild, or been mistreated in captivity. and boasts technology such as wireless digital X-Ray, thermal imaging, and an actual elephant ambulance. 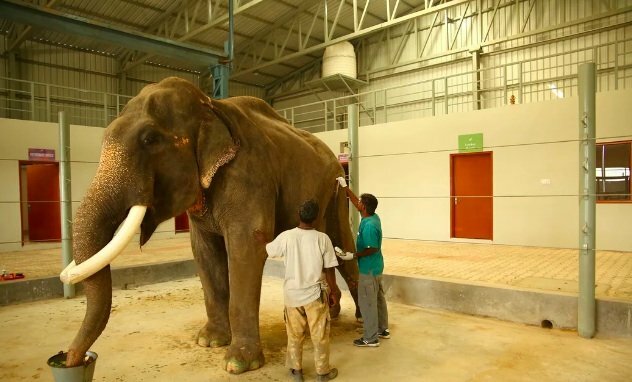 Considering the nature of the center, who better to be rehabilitated first than 70 year-old elephant Gajraj, who ha spent 50 long years in grim captivity. Gajraj found himself at the center of the wildly successful #FreeGajraj campaign funded by PETA India and its international affiliates a couple of years ago. The majestic beast was illegally plucked from his home back in 1965 and spent 50 long years chained to tourists spots, Shri Bhavani Museum and Yamai Devi temple in Aundh, Satara, where visitors would ride on his back. Thankfully, he was rescued about a year ago, and will now be the first patient at the Wildlife SOS elephant hospital. Having to endure these conditions meant that Gajraj developed wounds and abscesses on his feet, and generally had a miserable life in very poor health. Horribly, Gajraj’s tusks were hacked off, and he was frail from poor diet and dehydration – all the while being chained by each leg and made to work for all of those years. It goes without saying that this is no kind of life for such a beautiful creature. Thankfully, Gajraj will now be able to live out the rest of his days in peace, health, and tranquility, after being checked in to the sanctuary. “Gajraj’s time in captivity left him with multiple health issues including a large painful abscess on his right hip and thin, worn out footpads that were so thin in some places that they had turned pink,” said Yaduraj Khadpekar, senior wildlife veterinary officer. The #FreeGajraj campaign was something that touched the hearts of thousands of people the world over. After thousands of letters, calls, emails, signatures, and protests, Gajraj was eventually rescued and sent to one of Wildlife SOS’ care centers, where experts have continued to provide top-standard care at the facility. “We are currently providing him with routine foot care treatments and have introduced prescribed supplements to his nutritious diet,” Khadpekar added. The highly-trained and passionate staff at the center are working tirelessly to reverse the trauma that Gajraj suffered through the last 50 years. We’re so happy that Gajraj will live happily-ever-after at the facility. After all of that horrible treatment by other humans, he deserves all the love and compassion that the staff can offer.